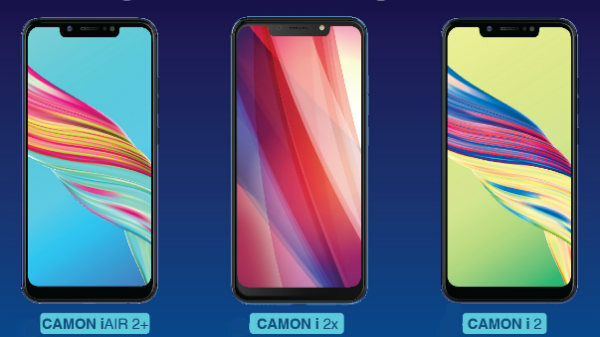 Primer Smartphone manufacturer company - Tecno launched three cameras in Camon i series Camon iAir 2+, Camon i2 and Camon i2X in the budget phone. These three smartphones have been launched with dual rear camera and excellent display specification. Apart from this, the Artificial Intelligence feature has been given in the camera too. Come on, know about the price and features of these three smartphones. Techno Camon iAir 2+ has been launched in India for Rs 8,999. This smartphone has been launched at the cost efficient range in this series. Camon i2 has been priced only Rs 10,499 and the Camon i2X has been priced at Rs 12,499. You can buy these three smartphones from more than 35,000 retail stores enire the country from Wednesday. With this smartphone Reliance Jio users are being offered a cashback of Rs 2,250 and 50GB data free plan. All three smartphones support Dual VoLTE. Along with this, 3,750 mAh battery is also provided in this. All three phones come with a 6.2-inch Full HD Plus display, which has an Aspect ratio of 19: 9. The display of camon iAir 2+ display has been given 720x1440 pixels. In addition, it has 2.5D worm glass protection. According to the company's claim, the screen-to-body ratio of the display has been given 88 percent. MediaTek QuadCont MT6761 SoC (System on Chip) processor has been given in Camon iAir 2+. The phone has 2GB of RAM and 32GB of internal storage. The phone's storage can be increased to 128GB via microSD card. The phone has 3,750 mAh battery. The phone runs on Android OSO 8.1 operating system. Talk about camera features, with 13 megapixels and 2 megapixel dual rear camera with LED flash. At the similar range, it has an 8 front megapixel camera for better selfie and video shooting. 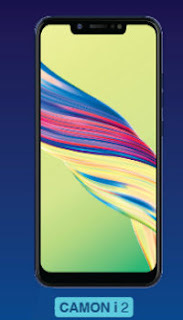 Camon i2 has 3GB of RAM and 32GB of internal storage. The phone's storage can be increased to 128GB via micro SD card. The phone has 3,750 mAh battery. The camera features of the phone are provided with 13 megapixels and 2 megapixel dual rear camera with LED flash. At the same feature, a 16 megapixel back-end camera has been given for better image resolutions. The phone comes with fingerprint sensor and face unlock feature. 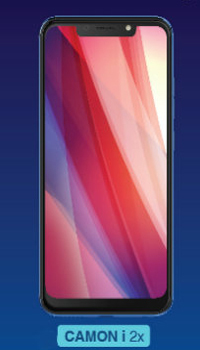 Other features of the phone are similar to Camon iAir 2+. Camon i2X has 4GB of RAM and 64GB internal storage. The phone's storage can be increased to 128GB via microSD card. The phone has 3,750 mAh battery. The camera features of the phone are provided with 13 megapixels and 2 megapixel dual rear camera with LED flash. At the same similar, a 16 megapixel camera has been given for good Selfie. The phone comes with fingerprint sensor and face unlock feature. 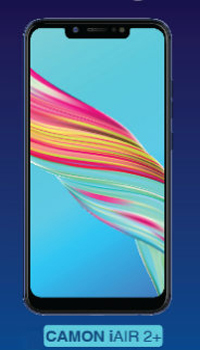 Other features of the phone are similar to Camon iAir 2+.